F.3.E.A.R or, as I will henceforth call it, Fear 3, lacks the compelling story and atmosphere to make it a great game. Confusing level design and some infuriating enemy types also hinder the experience. Admittedly I am completely new to the franchise, which severely hinders my ability to understand anything going on, but the game is unforgiving of my newness. 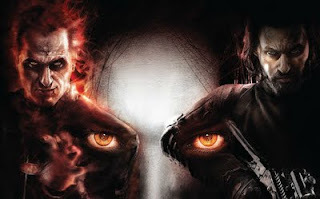 Having abandoned its horror roots, Fear 3 is a decent shooter at best; that is until a second player joins the match. Cooperative play, like Steve Rogers’ super serum, can turn a weak game into a marvel. With a friend along for the ride, Fear 3 overcomes many of its nuisances. Highly authored stories aside, I wonder why I should ever bother playing a single-player first-person shooter again. To be clear, Fear 3’s cooperative mode differs from others quite significantly. Rather than play a duplicate of Point Man, the game’s protagonist, coop partners control his ghostly brother Paxton. A spectre with just enough corporeality to receive bullet wounds, Paxton’s abilities are quite unique. Armed with an endless supply of “mind bullets,” he can fire on enemies from afar as though armed with a pistol. In his ethereal form, Paxton cannot wield weapons. He can, however, levitate enemies and most notably, possess them. The second player can leap across the battlefield with the possession ability, taking control of particularly troublesome or distant enemies for a short period of time. More than just a clever gimmick, the possession mechanic vastly improves Fear 3’s combat encounters. In the single-player game, intelligent AI and room layouts force players to constantly move from cover to cover, never quite getting the advantage over opponents. The game feels more hectic than strategic. By giving a second player the ability to essentially teleport across the room, coop partners can devise offensive plans on the fly, flanking enemies in an instant or drawing fire as necessary. During most battles, I found myself calling out targets for my partner to dispatch while I positions myself to help their forward movement. Likewise, my teammate would describe which enemies he possessed and their weapon loadout, keeping me knowledgeable about our circumstances. Paxton offers a completely different play experience than Point Man. Possession lasts only for a short period of time, but can be extended by picking up orbs dropped by enemies. Since the possessed soldier body must be killed first, the coop partner has every incentive to dive into the fray, killing as many enemies as possible without too much concern. Even the suicide bomber enemy types (uninspired annoyances in most games, perhaps save for the Gears of War and Halo series), are entertaining when players can take them over and become walking explosives. While my paranormal partner and I are only halfway through the game, I see no reason to continue without them. I can safely say were it not for its clever use of cooperative play, Fear 3 would hold no interest for me. In fact, I am most shooters seem increasingly irrelevant without cooperative play. The one exception, of course, is the much anticipated Bioshock: Infinite. But what if Irrational were to allow someone else to join the battle? I might be even more eager to explore Columbia with a friend. I love love love <3 LOVE!! FEAR 2. It's one of my favorite shooters of all time. Atmosphere, story (kinda), and fun fun fun mechanics. I was really let down by F3AR, and if co-op was the defining element of the game, they should have let me know before I bought it. Grrrr! Alas, Day 1 Studios did not live up to Monolith's creation. While I don't know if co-op can salvage the experience for you, especially since I you have so much love for its predecessor, I would recommend giving it a try. You also bring up a good point about marketing co-op as a defining element. I could safely say Trenched is a far better multiplayer game than a single player game. I think they stress it enough, but maybe not.